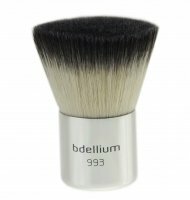 Studio Line - Slanted Kabuki by Bdellium tools. The brush is designed for application of powders and mineral foundations. Suitable shape allows cosmetic to be stretched outside the contours of face. 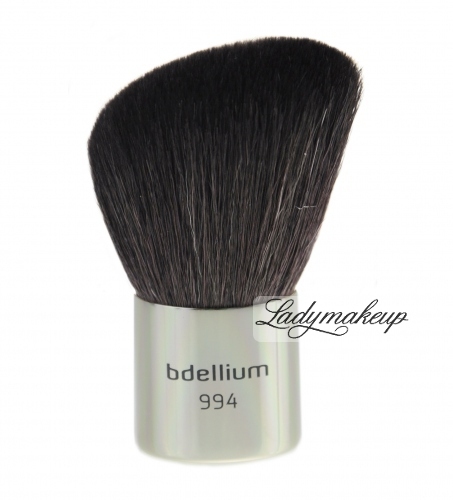 The brush was made of a blend of natural and synthetic bristles. It has excellent elasticity and perfect softness. This allows you create perfect and impeccable make-up. The handle is made of thick metal, which prevents the bristles from falling out and deforming. The logo and name of the manufacturer are included. Keep in mind that regular washing of the bristles keeps them in perfect condition. Use a small amount of shampoo, foam, rinse with water, squeeze and leave to dry on a towel. Plastic tube provides safe transport and storage.